This unique full service house on the Chongwe River is ideal for a private Zambia safari in the Lower Zambezi Valley. Guests have exclusive use of the facilities and services. Making a break from the traditional Zambia bush camp, Chongwe River House is the perfect alternative. It's exclusive, fully catered and managed with private guides, vehicles and an armed scout. In the wilds of Africa, guests here can have a truly unique Zambia safari. This 4 bedroom private house stands on a tributary of the Zambezi River. The Chongwe River is the main water source for game in the area. Guests can see the animals coming to drink and feed from the en-suite bedrooms, sitting room and deck. The Chongwe River forms the boundary for the Lower Zambezi National Park. This area is known for its large herds of Elephant and Buffalo. The huge male Elephant are often seen feeding in the winterthorn grove in which the house is located. 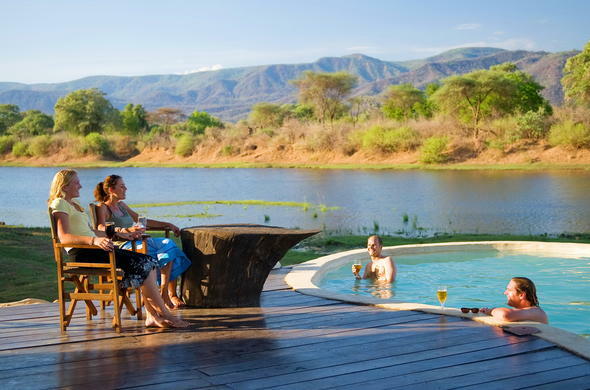 Chongwe River House is a truly unusual home. Built entirely of ferro walls and wildwood, the shape and design follows the curve of the wood. The furniture in the sitting room is carved from a single giant tree trunk. The house flows from one area to the next with many highly original features and spectacular views. Activities are varied and overseen by experienced guides. The lure of the water is irresistible for fishing and canoeing. Game drives cover diverse habitats during the day, and encounter nocturnal creatures including Leopard at night. Walking safaris visit the Chongwe Falls and escarpment as well as the plains and riverine forest.